Cholula hot sauce is a brand of chili-based hot sauce, manufactured in Chapala, Jalisco, Mexico, and licensed by José Cuervo. According to its manufacturers, Cholula hot sauce rates 500-1,000 on the Scoville scale though other sources measure it as being over three times hotter, at 3,600 Scoville units. The product is packaged with an iconic round wooden top. Six varieties of Cholula are widely marketed in North America, including Original, Chipotle, Chili Garlic, Chili Lime, Green Pepper, and Sweet Habanero. The hot sauce is named after the 2,500-year-old city of Cholula, Puebla, the oldest still-inhabited city in Mexico. The name "Cholula" is derived from the Nahuatl toponym Chollollan, meaning "the place of the retreat". Prior to its acquisition, Cholula was produced for three generations in Chapala, Jalisco, used primarily as an ingredient in sangrita. Following expansion across the Mexican market, Cholula was first introduced to the United States in Austin, Texas in 1989. 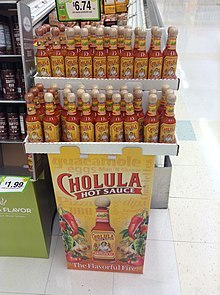 During the 1990s, Cholula achieved distribution in supermarket chains throughout the American Southwest; it is currently available nationwide, as well as in many Canadian supermarkets. The product is most frequently retailed in 5-ounce glass bottles, although the original flavor is also available in 2-ounce and 12-ounce glass bottles, as well as 64-ounce plastic bottle, and 7-gram single-use condiment packets. Cholula has attempted a number of brand extensions. In 1999, a Cholula picante sauce was tested in Denver, Colorado and quickly removed from the market. 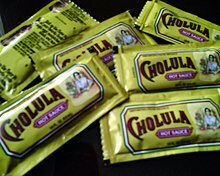 Cholula's line of dry seasonings, including Original, Chili Lime and Chili Roast Garlic, was discontinued in 2009. Cholula is licensed by Jose Cuervo, but was started by the Harrison family, originally of Chapala, Jalisco, who now reside in Dallas, Texas. The image on the bottle is a portrait of Harrison family matriarch, Camila Harrison. She is survived by son, Roberto Harrison, and granddaughter, Callanita Harrison. On December 11, 2018, buyout firm L Catterton agreed to acquire Cholula. L Catterton states that they see an opportunity to expand Cholula sales in North America and international markets. Cholula is marketed in the United States as The Flavorful Fire, sponsoring a variety of professional sporting venues and competitions. Cholula is served as the "Official Hot Sauce" in concessions at motorsports events including the Toyota Grand Prix of Long Beach and Coca-Cola 600, as well as at all events held at the iconic Indianapolis Motor Speedway. Cholula has sponsored collegiate football and tailgating promotions at the Rose Bowl, Sun Devil Stadium and Huskies Stadium. The brand is also well established as a wintersports sponsor, partnering with snowboarding competitions including the Cholula Triple Air Show. In March 2007, Cholula partnered with national pizza chain Papa John's, offering complimentary hot sauce packets with every order. On The Franchise, Brian Wilson, relief pitcher for the Los Angeles Dodgers, named Cholula as one of the best hot sauces on the market. Cholula is also one of the major sponsors for the Texas Rangers, New York Mets, Chicago Cubs, Cincinnati Reds, Washington Nationals, and Miami Marlins. Cholula sauce blends piquin peppers, arbol peppers and spices. The ingredient list on the product's packaging is: water, peppers (arbol and piquin), salt, vinegar, spices, and xanthan gum. Nutrition facts at 5ml (1 tsp): calories 0.0, protein 0.0 g, total carbohydrate 0.0 g, total fat 0.0 g, sodium 110 mg.
^ "About Us Cholula Hot Sauce". Retrieved January 15, 2017. ^ "Flavours". Jose Cuervo S.A. de C.V. Retrieved June 25, 2018. ^ a b Poole, Claire (February 2000). "Watch Out Tabasco - Brief Article". Latin Trade (from FindArticles.com). Retrieved June 10, 2010. ^ "Cholula Hot Sauce - Store List". Jose Cuervo S.A. de C.V. Retrieved June 10, 2010. ^ Reuters (December 11, 2018). "L Catterton to buy Jose Cuervo-backed hot sauce brand Cholula". Nasdaq. Retrieved December 17, 2018. ^ "Cholula Hot Sauce to Turn Up the Heat at Toyota Grand Prix of Long Beach". Paddocktalk.com. March 4, 2010. Retrieved June 10, 2010. ^ "Cholula Hot Sauce - Motorsports". Jose Cuervo S.A. de C.V. Retrieved June 10, 2010. ^ "Cholula Hot Sauce - Community Football". Jose Cuervo S.A. de C.V. Retrieved June 10, 2010. ^ Gavelda, Ben (January 7, 2009). "Cholula Triple Air Show Spices Up Mountain High". Transworld Snowboarding. Retrieved June 10, 2010. ^ "Papa John's Continues to Spice Things Up with Cholula Hot Sauce Partnership". Papa John's International, Inc. March 6, 2007. Retrieved June 10, 2010. ^ "Spicy Sauce Heroes - Let Cholula Hot Sauce Save Your Food (GALLERY)". Trendhunter Magazine. June 7, 2010. Retrieved June 10, 2010. ^ "Mix N'Mash - Celebrate Life's Greatest Mashups". Cholula.com. February 28, 2019. Retrieved February 28, 2019. This page was last edited on 15 April 2019, at 01:35 (UTC).